Enter your email address below to begin saving with our exclusive members only discount! Enter your email address. We'll approve your membership and sign you up to receive the deepest discounts possible on hundreds of items. Simply log in to your member account HERE or at the top of any Instrument Alley page "My Account" and receive instant discounts on hundreds of items in our store. Simply put, WE SELL FOR LESS and will not be UNDERSOLD! Many manufacturers won't allow us to list our unbeatable low prices. If you want to avoid price matching, searching online for the lowest price and paying more for your gear than you have to, then this is for you. 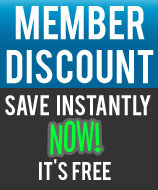 It's FREE, there is no obligation and every item we sell that is offered at a discounted members only price will be automatically shown when you are logged in to your account. You will get our discounted prices on all qualified items for life, for free!! Generally higher priced items will have greater savings. Many accessories and lower priced items may not show significant discounts. Coupons, promotions and other discounts do not apply to our bottom dollar member pricing!